Welcome to androidforum. Good guidance buddy. Here is another tutorial that helped me recovery deleted photos from Galaxy s5. The recovery app supports a wide range of android phones. You can use it to recover deleted photos, contacts, text messages and videos. Hope this help if OP's method didn't work. 1) If the lost photos are saved in the internal memory of the Android smart phone. You need a professional Android data recovery tool to retrieve them. 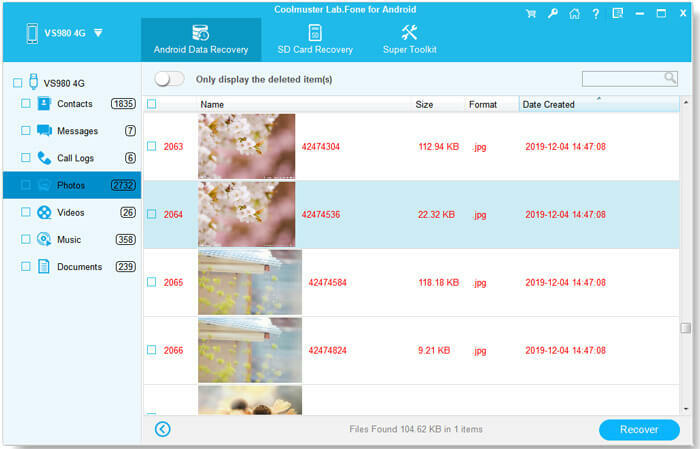 Note: Normal picture recovery software can not recover any files from the Android phone's internal memory. 2) If the missing pictures are stored on an external memory card. You just need a normal memory card image recovery tool to get them back. Hope to help people in need. Keep in mind: rooting is required if you were going to use third-party recovery programs.